several years of work described in papers by Jason Box and colleagues. They have put together reconstructions of the Greenland ice going back decades - from 1840 to 2010.
reconstructions of sea surface temperature based on work by Michael E Mann and co (2009). Stefan Rahmstorf was exploring the observed cold spot in the North Atlantic, in the region where the surface ocean water turns over and drives the thermohaline circulation. The way I understand it is - when it's working well, the salty water from the tropics shifts north via surface currents and, because salt water is denser than fresh and freezes at a lower temperature, it sinks. This drives the ocean conveyor belt. If this saltier water is diluted with cold fresh water, it doesn't sink as easily and that huge ocean pump slows down. The paper doesn't include measurements of the speed of the ocean circulation system. It is about the cold region and how there are indications that it is the coldest it's been in the past thousand years. From this it is inferred that the ocean circulation system itself is slowing. Here is a map from NOAA, which I've annotated to show the region that this research is focused upon. We thus assume that differences in surface temperature evolution between the subpolar gyre and the whole Northern Hemisphere are largely due to changes in the AMOC. It's not really that simple. There is more to the paper than that. The authors list other lines of evidence, too. I've put some links to further reading below, if you can't access the paper itself. The gulf stream system is the surface ocean current that carries warm water northward in the Atlantic, from around Florida in the eastern USA and meanders way up north. As I understand it, if the conveyor belt slows down, then this affects the gulf stream, so the warm water wouldn't travel as far. Hence, it must be concluded that predictions made with these models regarding the response of the ocean's thermohaline circulation to the buildup of the atmosphere's greenhouse blanket could be in error. Even so, there is no reason to believe that these models are supersensitive to perturbations. It may well be just the opposite. So, until the next generation of models comes along, we must take seriously the predictions by the existing ones that a large buildup of greenhouse gases might cause the ocean's thermohaline circulation to collapse. We also must take seriously the possibility that such a collapse would have profound consequences to atmospheric operation and hence global climate. Of course, those who challenge the validity of the sizable greenhouse warmings predicted by these models will fault this result on the grounds that the warming and freshening of polar waters necessary for a thermohaline shutdown will not occur. A slowdown of the Gulf Stream and ocean circulation in the future, induced by freshening of the waters caused by anthropogenic climate change (via melting glaciers and increased water vapor transport into high latitudes) or simply by warming, would thus introduce a modest cooling tendency. This would leave the temperature contrast across the Atlantic unchanged and not plunge Europe back into the ice age or anything like it. In fact the cooling tendency would probably be overwhelmed by the direct radiatively-driven warming by rising greenhouse gases. There is no sign in our index that a weak AMOC caused the LIA in the Northern Hemisphere; rather the data are consistent with previous findings that the LIA reflects a response to natural volcanic and solar forcing, and if anything this surface cooling strengthened the AMOC at least during the first part of the LIA. The fact that LIA coldness seems to have been even more pronounced in South America than in Europe further argues against a weak AMOC, as the latter would have warmed the Southern Hemisphere. Anthony Watts has already written two articles protesting the study (archived here and here). Two protest articles isn't a lot by denier standards. (Remember Marcott13 and the 30 plus WUWT protest articles!) However the fact that Anthony returned from his months-long vacation to write them, and that he wrote them back to back, suggests that the paper worries him rather a lot. It's important to deniers. It also shows that he realises that climate science deniers typically only recognise the names of a very small number of climate scientists. Anthony's protests are focused on the lead author, Stefan Rahmstorf and one of the co-authors, Michael Mann. He ignores the Greenland ice expert Jason Box and all the other co-authors. The climate scientist Martin Visbeck from GEOMAR Helmholtz Centre for Ocean Research Kiel looks Rahmstorf's interpretation of the results critically: "The concentration of study on the part of the subpolar Atlantic and the spectral analysis are interesting," he says. But there were also other estimates of the AMOC, pointing to a very different course. The work does not provide strong evidence for the development of the AMOC during the past fifty years. Between 1992 and 2012, we completed 20 years of operations measuring currents between the U.S. East Coast and Bermuda, spanning the outer shelf, the Slope Sea (between the continental shelf and the Gulf Stream), the Gulf Stream, and the Sargasso Sea. Here we present multiple lines of evidence suggesting that this cooling may be due to a reduction in the AMOC over the twentieth century and particularly after 1970. Since 1990 the AMOC seems to have partly recovered. In more recent years, as knowledge of ocean dynamics and modeling skills have improved, it is more widely thought that the MOC might weaken to some degree, but neither shut down nor increase in strength [Intergovernmental Panel on Climate Change Fourth Assessment Report, 2007; Yin et al., 2009]. While comforting, considerable uncertainty remains, especially given indications of increased ice melt on Greenland [e.g., Jungclaus et al., 2006], hence the need for continued and improved observation and further research [e.g., Srokosz et al., 2012]. I fully expect Rahmstorf15 will generate some discussion and controversy in scientific circles. I'd take notice of that and ignore the idiocy of deniers, who reject everything and anything to do with climate as a matter of course. I also expect that there will continue to be a lot of research on the subject. The big worry will be the impact of the melting of Greenland. That will need to be closely monitored. Anthony Watts has written a third article (archived here) protesting the Rahmstorf paper. This latest one is about a NASA study, which, like the Rossby paper, found that the AMOC showed no significant slowing between 2002 and 2009, and that it "sped up about 20 percent from 1993 to 2009". The twentieth century shows a gradual decline in the AMOC index, followed by a sharp drop starting around 1970 with a partial recovery after 1990 (discussed further below). This recovery is consistent with the finding of an AMOC increase since 1993 based on floats and satellite altimeter data 19. BTW -- Anthony got so excited that he thought the NASA press release was new. He was much chagrined to be told by Andrew Freedman that it was from 2010! Dr. Rahmstorf developed a model of a sea level rise, ignoring an inconvenient fact of a limited water supply on our planet. You can read more about this research at realclimate.org and on Jason Box's blog. Both articles are full of links to further reading. Chris Mooney has written an article about it, too. There's a nice blog article by Kaitlin Alexander at ClimateSight about AMOC and the gulf stream. She wrote it a couple of years ago. There's also an easy-to-follow article about the gulf stream system at the Max Planck Institute for Meteorology website. My opening volley was "failure to understand the subject matter is not debunking." Have you been subjected to an 'intervention' by their comedy attack dog dbstealey yet? Oh yes, we "met" the other day... He is currently "disgusted by you and your ilk". I have also drawn the ire of .mod who promptly Godwin'd the thread. "I feel like a ban is imminent..."
I've had that feeling a few times. That's Stealey-logic alrighty, but not quite his usual voice. dbstealey seem to have the job of attack dog on that site. His job is to respond to any pro-global warming comment with whatever nonsense he can dream up. It's funny how he only shows up when there's a disagreement with the article. He proceeds to convolute and distract from the original topic, ultimately devolving into his calls for my identity. And yes, I have a problem following simple directions haha. It is a diversionary tactic, and also gives "the faithful" the impression that he has countered your comment. It relies on "the faithful" not actually understanding the comments, of course. I have seen similar behaviour in anti-vaccers, chemtrailers, Creationists, and (that strange bunch) Electric Universe supporters. @Someone Else. I used my real name and business email address to join WUWT and my profession is specifically described in that email address. In or around September last year Anthony and Stealey attempted to intimidate me by posting pictures of me. All up 7 photographs of someone sharing my name and nationality (but not my profession) were posted. I have never been slow to seek legal remedies, so I wrote to Anthony that I intended to own his house and demanded that he contact (via facebook) the person he was passing off as me and apologise for maliciously and falsely dealing in his image. He shat himself and apologised both to me and the owner of the photographs. He emailed the link to the apology and then banned me and removed every trace of me from the site. He will not even allow others to refer to me so strict is that ban. His intimidatory conduct has no place on any blog let alone one that claims to be a science site. Watts and Stealey are peas in a pod - gutless and contemptible. DB frequently speculates about my personal details. On one particularly heated thread he divulged his height and weight and muttered something about knowing what state I live in. I told him that I'd save him the expense narrowing that down and published my full street address. Told him to stop by for a visit any time. That pretty much took care of that. PG ... I begin to understand more and more. I saw DB and one of his tag team/sock puppets speculate on my identity. Yeah does seem to be a pattern of intimidation here. I know I had one clown checking my Twitter feed, he tried to make something out of my attendance at a Climate March I twittered about. The reason I described dbstealey as a 'comedy attack dog' is that as a moderator he is supposed to detect and stop the activity he himself indulges in: insults, threats, sockpuppetry. Even if the numpties at WUWT cannot understand the science they ought to be able to understand that moderators are not supposed to behave like trolls. Its another good indication of WUWT's credibility. You'll only very rarely see anyone come out in support of what Smokey/dbstealey writes at WUWT. I think even WUWT-ers see him as a joke (at best). "I have exactly one (1) screen name, which is also my real name. I do not use multiple identities. Why should I? I wear my heart on my sleeve. Everyone knows exactly where I stand. [...] It’s called ‘projection’. Now, why would you assume I am using anything but my real name? Projection, no doubt." This from "dbstealey", also the moderator "dbs", who also posted at WUWT as "D. Boehm" and the infamous "Smokey", often on threads where he was moderating as "dbs" and clipping/slamming anyone who disagreed with his sock puppets. Yes, "It's called projection.". Astounding. Wow, sounds like I've just seen the tip of the iceberg. I think my new personal policy will be to ignore him lol. That might fire him up even more. I had a conversation in the FEMA thread with a guy named D.S. that used the same logic as him, he wants to arm everyone in America in order to stop violent crime. That thread KR posted gets even funnier after the dbstealey bit KR quoted. "Someone Else" is giving dbstealey such a hard time that the ".mod" starts intervening in support of dbstealey, the guy who does not use multiple identities. No points for guessing who ".mod" is. Visbeck is a personal hero of mine. I'm sure if you pressed him on it, he would agree that there just isn't enough observational literature on the subject. But hey, why delve into the details when you can just take what one scientist said without any context and extrapolate from there? Yeah - from my reading of the quote, that is exactly what Visbeck meant. (I don't speak German so can only go by the Google translation.) The bulk of the newspaper article was about the study. The way the journalist wrote the quote, and then added some of their own at the end was just to add a bit of journalistic spice. Anthony's added a third protest article (see the update above). Thing is, all his 'evidence' far from contradicting, only adds support for the Rahmstorf paper - all consistently showing a possible speeding up of the AMOC from around 1990 to around 2010, including this new paper. It's four now. He must be really scared. From Global and Planetary Change, a new paper challenging Rossby's conclusions via multiple data sources. • Three different data sets agree on the 2009/10 decline in AMOC and the Gulf Stream. • Sea level difference across Gulf Stream detects variations in AMOC. •Sea level is used to construct a proxy for AMOC variability for 1935–2012. 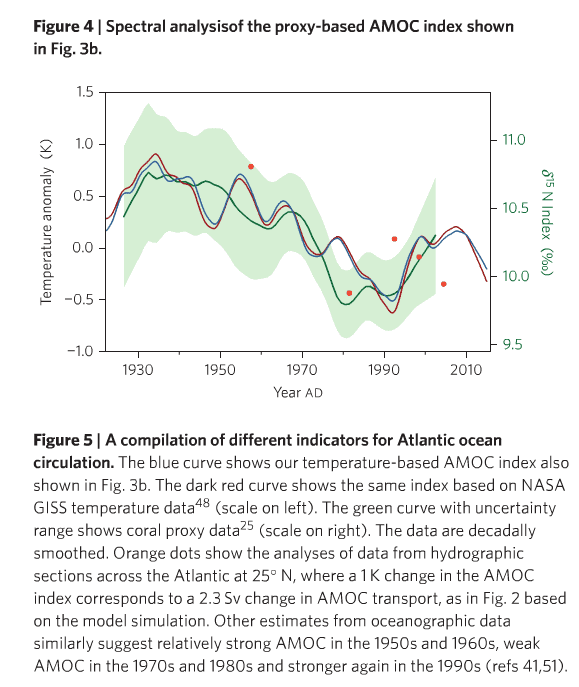 •The weakening in AMOC after 2004 is compared to a similar decline in 1960s–1970s. Because of the different lengths of the records and the different instrumentations used, as mentioned above, there are sometimes discrepancies between different studies of the GS which may create confusion. For example, Rossby et al. (2014) claim that the Oleander data does not provide evidence that the GS is slowing down, a claim that appears to contradict evidence from other data showing recent slowing down of the GS (Sallenger et al.,2012; Ezer, 2013; Ezer et al.,2013) and weakening AMOC (Smeed et al., 2013). However, a close examination here will show that there is no real contradiction between different data sources. Note that the conclusion of Rossby et al. (2014) about a stable Gulf Stream, with large variability and no significant trend, was based on only a portion of the Oleander line (OGS) which is affected by eddies more than by AMOC and does not address the trend during the RAPID period. The main point here is that the 3 data sets are generally consistent with each other and the apparent discrepancy in different studies one may mistakenly infer from Rossby et al. (2014) reflects the fact that the studies look at different periods and only part of the data (i.e., subsection OGS rather than the whole section). I've been getting the feeling that ambiguous definitions and/or terminology in the literature itself is part of the "problem". There is a real problem if my sense is correct, but there's so much here I know absolutely nothing about that I don't think I can sort it. ... re-reading David Sanger's comment below, I see my comment here is somewhat redundant. I appreciate the breakdown, Brandon. I'm afraid I misrepresented it above. Glad I could help, you're welcome. There is a new paper in Nature Climate Change by Stefan Rahmstorf and others, which is getting a lot of protest from deniers. This signifies that it is potentially an important paper. I likely is an important paper, but the attention of the mitigation sceptics only tells us that they do not like it. They do no know enough about science to judge whether an article is scientifically important. The US sceptics should not like this message, the slowing down of the ocean circulation will reduce warming for Europe and increase warming for the USA. That creates a shift in the power balance. That although America is already plagued by severe weather, while Europe has a very moderate climate. The preoccupation with Michael Mann is a clear sign that WUWT is a political hate blog. The audience has been conditioned to stop thinking when they hear the name Michael Mann. A science blog would call this a Rahmstorf paper. If you want to legitimize Mann, help him produce error bars, and the rationale behind them. I re-posted Fig. 4 from the paper AND went and dug up Fig. 5b from MBH98. The response? J C is now citing Anthony Watts in this matter over at CE. Judith Curry leaving no depths unfathomed with only 20% of air left in her tank. Will she ever make back to the surface? Yes I saw that. She also starts off her comments with some ad hominems and straw men. She probably doesn't even remember those long-ago days when she worked at being a scientist. I think you can classify her comments as "poisoning the well". Here's Michael Mann specifically addressing the claims that his study is contradicted by the Rossby paper. "Some critics have tried to make hay over a previous article from last year by URI Graduate School of Oceanography scientist Tom Rossby (see: http://www.gso.uri.edu/b…/rossby-gulf-stream-is-not-slowing/) they claim contradicts our recent Nature Climate Change study finding evidence for a long-term slowdown of the Atlantic Meridional Overturning Circulation ("AMOC"). [Tom incidentally is the son of the great meteorologist Carl-Gustaf Rossby of "Rossby wave" fame: http://en.wikipedia.org/wiki/Carl-Gustaf_Rossby. He also happens to be a friend. He is one of leading physical oceanographers of our time. His scientific work is extremely thoughtful, careful, and solid]. 1. One man's signal is another man's noise: Over the relatively short interval (1993-2012) in question, we too find little or no net trend (!). The trends that we identify in our article are longer-term in nature, and are corroborated by independent studies and independent data (e.g. Nitrogen isotope data from corals) as documented in our article. 2. What Rossby is measuring is largely associated with the wind-driven boundary current of the subtropical horizontal ocean gyre, the warm poleward current that hugs the coastline of the southeastern U.S., the current that *physical oceanographers* refer to as the "Gulf Stream". This is rather different from what we are looking at, which is what oceanographers instead refer to as the "AMOC" and more specifically, the "thermohaline circulation" (sometimes also called the "conveyor belt" because of the shape of the circulation cell, which in the Atlantic carries warm waters northward near the surface and cold waters southward at depth, thus providing a net transport of heat poleward). That vertical overturning circulation is driven instead by lateral density contrasts that arise due to variations in temperature and salinity. The shallow component of this ocean circulation pattern does not recirculate within the subtropical gyre and instead continues northward across the North Atlantic toward Iceland and Europe. That component is typically referred to as the "North Atlantic Drift" by oceanographers. It is not the "Gulf Stream". But the problem: in common parlance (and numerous news articles and reports), it *is* referred to as the "Gulf Stream". So in short, we and Rossby aren't really looking at the same current system (though one might think so due to the confusing and often inconsistent use of the "Gulf Stream" terminology), and even if we were, both studies agree that there was little or no trend over the quite short interval of 1993-2012. It is always useful to question new studies, and subject them to the full scientific scrutiny they deserve. And Carl Sagan's famous maxim "the more extraordinary the claim, the more extraordinary the evidence must be" certainly applies. But bad faith efforts to confuse the public by erroneously conflating two very different findings has no place in the public discourse over the science and its implications." She is a scientist and academic yet she is comfortable in relying on AW's deceptive and malicious drivel to support her groundless attack on Mann. That's more than laziness..way more. I have this recollection I read a study that the winds in the North Atlantic are also important. The warm hypersaline water from the tropics does sink somewhat before it gets to the North Atlantic. Strong winds then expose the warm hypersaline water again and allow the heat to be transferred to the atmosphere. The now-colder water sinks again and travels south. It stuck in my mind because it also said the "Gulf Stream" is not the same as the AMOC. If I can remember where I read it I will post - it may add some interesting points. As Mann says in the text above quoted by David Sanger, the AMOC and what is considered as the Gulf Stream by oceanographers are two separate things, but Stefan is seemingly conflating them right there on his own home page. IMO, Real Climate are shooting themselves in the foot on this one, and they should get their act together fast and try to clean up the mess! Unfortunately, the damage has already been done: the AGW deniers have the memory abilities of a goldfish when it comes to anything scientists get right, but when scientists get it wrong, they have the memory of an elephant. You'll still be hearing about it 30 years from now. I do not know if there is a difference between "Gulf Stream" and "Gulf Stream System". My understanding is the Gulf Stream makes up part of the AMOC. Words are not always completely unambiguous. The corresponding articles describe what they mean with it. That that differs between articles and that that may be important for the interpretation is a fact of life. When someone talk about the global mean temperature, you also sometimes need additional information, such as which dataset exactly was used. The unreasonable will always complain, there is nothing we can do against stupid comments by the mitigation sceptics by to ignore them when it comes to science. Does not clear up the Gulf Stream/Gulf Stream System ambiguity, but does abundantly describe the scope of his study. *I* know they're talking about the AMOC up there on Real Climate, and *you* know they're talking about the AMOC (because we take the time to read the whole article), but as Victor says, deniers are gonna deny so why hand it to them on a plate? You know they're going to quote mine the 'Gulf Stream' bit out of the first para and have a field day with it, not bothering to read any further because they've already satisfied their confirmation bias. Well yes, I did have a bit of "really guys?" reaction along the lines of serving one up on a gilded platter -- not for the first time -- but that's where you and Victor both make the salient point: haters gonna hate. Especially when MEM is in the the list of authors, not least because the fact he's still publishing rubs their noses in their own impotence. Anon, thanks for the vid, that helped. But if there's any impropriety, even just unconscious, it must be observed that he's not the scientist, he a very naughty Roy. I'm sure it's not deliberate. It's quite conceivable that you could run a consistently outlying research organisation and never be curious about how that status was achieved. Deliberate or not this is going to be big. Well they're certainly not preoccupied by Toll's Cook13 rehash. ATTP is currently being way too polite with the guy when the kindest thing Anders could do is to counsel Richard to avoid posting comments after the cocktail hour....or is he always like that? Deliberate. Count on it. Anyway, until proven innocent! If the Po-Chedley paper helps to retire the "no tropical hotspot" meme (or the terrible twosome at UAH), humanity will owe the authors an enormous debt. PG. That's an amazing story regarding you being falsely exposed on WUWT. It seems that their calls for people to use their real identities is just a rouse to enable them to intimidate. They really are a despicable bunch. I haven't seen anyone mention what to me was the most hilarious aspect of Watts's first (?) post on the AMOC paper. In his haste to find as many faults as possible, he claimed that Greenland is gaining mass, not losing it. He did this by completely ignoring the past two decades' worth of actual data, measurements, observations ... and focused only on one single year's output from a climate model. Yes, the figures he included come from DMI, where, if you follow the links, you'll see that they basically are just running a climate model and predicting the surface mass balance (precip minus runoff, basically). There's no inclusion of discharge (ice mass lost from calving glaciers) of course, but the funny part is that the SMB data are purely 100% climate model output. So Anthony is rejecting actual observations in favor of climate model outputs. Go figure. Text of the press release: Using a highly simplified climate model, they examined various climate scenarios to verify their theory. My only possible response: Dear me, the only worse thing they could have done is used tree rings. Dealing with the dissonance 101: Are you auditioning for a job as village idiot? Dealing with the dissonance 201: Taken. Dealing with the dissonance PhD dissertation: It all stands or falls together, Brandon. Either climate models are reliable, and you have to accept that there will be no increase in extreme weather, or they are unreliable, and you will have to concede there is no basis for any type of alarm over increasing atmospheric CO2. So, which is it? Conclusion: We really are heading for an ice age ... due to global dimming.